I would love to understand how many IBM Beam Spring keyboards are still in use (at least for those who also are part of this forum). I wonder, if there are other people out there who would be interested. I’ve gotten hands on and personal with three beamsprings. I also had a German layout 3276, which I sold to Seebart a few years ago. There’s some pics on DT of it as well, if I can find them. That great white Displaywriter is in Scotland, too. Belongs to a museum, who had no idea what it was. I can open mine up and get you label details if you like. Don’t think it was particularly expressive in there. I don’t know its birthdate or even year, for instance. Maybe as old as me, but maybe not. I would guess that number on the right is the date ? But that does not make sense for US dates , in the rest of the world where normal people live i would think that was 19th Feb 1978? Please keep the data source field consistent. Makes managing data much simple. What’s your recipe for clean sticker removal? I’m atrocious at peeling. @Andy: Can we keep Google out of this? How about posting the info in this thread, which can then all end up in the wiki where it belongs? Oh, they nearly fell off by themselves, after being threatened by a hint of moisture. 5251 Bigfoot should be more rare. Can you post pictures of the 5251 Bigfoot? I am really interested in all the variants (and how many are still in use). This is probably a good thread to help you in your quest. Also here is a crappy photo of mine. 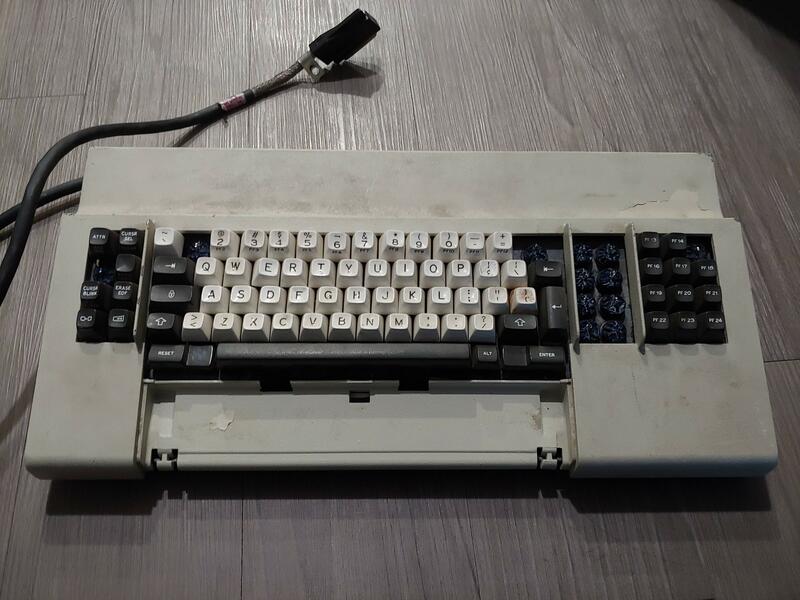 IBM DisplayWriter keyboard, 3277 terminal keyboard (66 key), IBM 4978 terminal keyboard (Series/1), IBM 3741 Data Station + bonus 3279 that is apart for restoration. Thanks a mil for sharing - no idea, why I haven't seen the thread before! That’s forums. Content is fundamentally time sorted, so sleepy threads go into permanent hibernation. There’s very few truly evergreen ones, and I mean the kind of evergreen that is regular new posts and routine visibility as a result. Great Finds and the Alps photos thread come to mind, and that one about how everyone’s wrong at music! As much as I personally prefer the forum thread format, this kind of thing is where wikis shine. Indexed content, for reference and long term addition. Just not conversation and personality, which keeps my visits few and brief. I see you are now the third person on here who has managed to find a 4978, nice work! You wouldn't happen to be willing to trade it for anything I might still have in my own collection would you? Hah! As a matter of fact I have recently sold off most of the beamers I have been hoarding over this past year for this very purpose. But sadly as high as beamspring prices might seem, housing prices in my area are far more absurd still. It certainly helps but the amount I have earned selling most of mine still doesn't fully cover the down payment! Hope the 5251 variant could do some help. Very nice. Do you have some more pictures of the case? That's not the usual 5251 case, that I know. I have an IBM Series I system which I purchased in 1978. I added to it up until the mid 1980s. I have 4978, 4979, 3101, and 3151 terminals which I purchased new. Recently I was looking through stuff on my shelf and I found a NIB 3101 that I did not remember that I had.